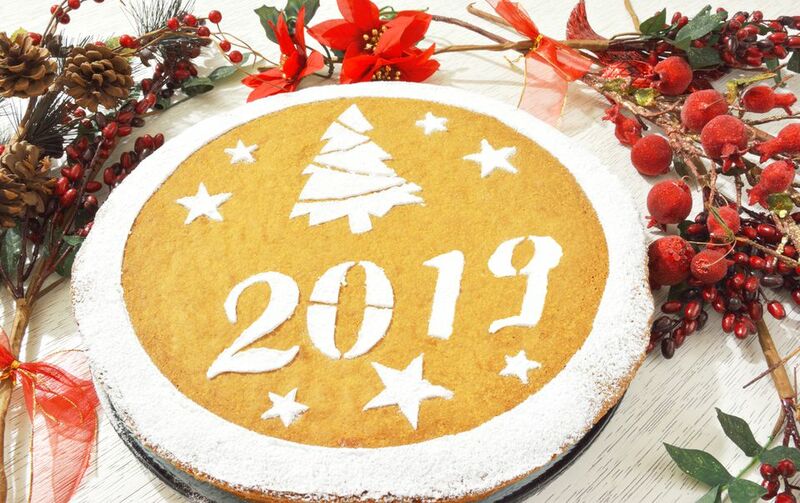 Of all the Vasilopita recipes, this one is the best for making at home because the texture is lovely (like a granular pound cake) and it lends itself to decoration, which is fun for kids. The recipe calls for self-rising flour. Bring all ingredients to room temperature, and preheat the oven to 390 F/200 C.
Cream the butter in a mixing bowl. Beating continuously, add in order: the sugar, very slowly, then the eggs one at a time, and finally the brandy. Flour a round 12" to 13" diameter tapsi (baking pan with 2 to 3" sides) and pour in the batter. The cake will bake for a total of about 45 minutes, but halfway through, when it has started to set, wrap a coin in foil and insert the coin carefully into the dough, pushing it down just below the surface. (Inserting the coin when the cake is slightly firmed will prevent it from sinking to the bottom.) Insert it anywhere except the exact center of the cake. Continue baking until done. Allow to cool for 5 minutes. Place a large plate over the top of the tapsi and invert it so the cake comes out on the plate. Take a second plate (for serving) and put it over the cake, invert to get the cake right side up. Allow the Vasilopita to cool for 4 hours before serving. (See photo) Sift confectioner's sugar to cover (decorations optional). Coat lightly with marmalade and sprinkle with grated coconut (decorations optional).